Comfort food perfection! My favourite homemade Creamy Mac and Cheese ever! Great cheese combines with a super creamy sauce, for an absolutely creamy, dreamy mac and cheese. I don’t think I’ve ever eaten a bad Macaroni and Cheese. Let’s face it, a plate of pasta and cheese sauce going to be pretty good no matter the recipe you start with. 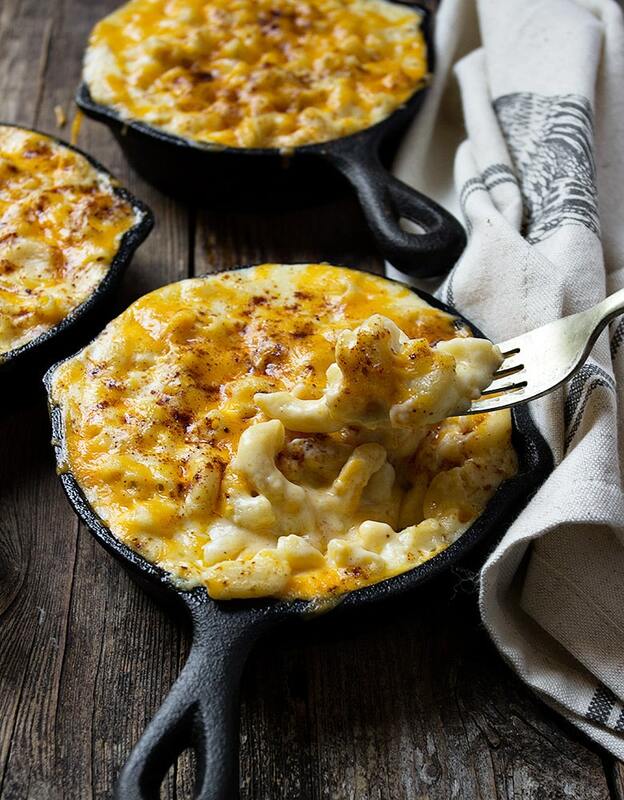 But when I enjoyed a bowl of the famous Beecher’s Macaroni and Cheese when I was in Seattle, I realized that macaroni and cheese could be more than just good – it could be really great. I think it was great for two reasons – it had lots of a wonderful creamy sauce and it was made with a really great cheese (and it makes a huge difference!). So like all food-obsessed people, I set out to recreate it when I returned home. Turns out, the Beecher macaroni and cheese recipe is available online, so it turned out that recreating it was going to be a lot easier than I thought :) My next problem was that I was in Canada and that wonderful Beecher’s cheese isn’t available here. 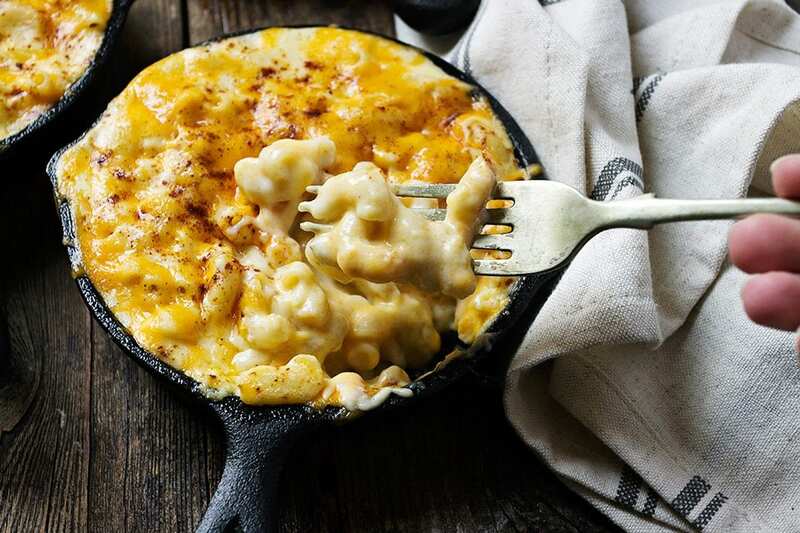 Thankfully, while Beecher’s is certainly great cheddar, there are a lot of other options available, as a great starting point for a perfect mac and cheese. This isn’t the exact Beecher’s recipe, but it is certainly based on it. Of course, the cheese is different, but it is also comes about as a result of a “happy accident” I made when preparing the published Beecher’s recipe for the first time. You see, I failed to properly read the instructions and added all 4 cups of the cheese sauce to the dish, instead of the specified 2 cups. Yes, I accidentally doubled the sauce and found macaroni and cheese heaven! It should be no surprise, of course. If 2 cups of cheese sauce is good, 4 cups has to be great, right? And great it was. The combination of extra, creamy sauce with really great cheddar was perfect. Experiment with your favourite cheeses and make your own signature dish. I loved the combination of a nutty, super old (crumbly) white cheddar with the sharp Canadian MacLaren’s Imperial cold-packed cheese. (Using two different ones gives a nice depth of cheese flavour). If you don’t have access to MacLaren’s, use a nice, sharp orange cheddar or possibly another brand of cold pack cheddar. I topped mine off with a bit of Extra Old Balderson Cheddar. To ensure your macaroni doesn’t get too soft, be sure to cook it 2 minutes less than you normally would, about 8 minutes. Rinsing well with cold water after draining will stop the cooking process and will also ensure your pasta doesn’t get too soft. When crumbling your cheese, don’t leave the crumbles too large. They need to melt by only the heat from the sauce. This process of turning off the heat, then adding the cheese to melt without bottom heat, helps to ensure the cheese doesn’t become grainy and is the secret to a smooth, creamy sauce for your macaroni and cheese! Don’t skip the chili powder or chipotle chili powder. It’s such a lovely smoky, spicy note. It complements the cheese perfectly, without over-powering it. Add a bit more salt if you need to. Taste your cheese sauce before adding the pasta and add a bit more salt if you think it needs it. Proper salting makes all the flavours here really shine. It's handy to have a scale for this recipe, to weigh the dry pasta and cheese. I've added alternate measurements where I could. Use a really great cheddar for this, as well as whole milk, if you can. It will make all the difference in the finished dish. I like to use two cheddars, a really great, aged one for most of it and then another one, a bit milder but still sharp, for a bit of depth of flavour. Experiment and find your favourite combinations. Add water and a bit of salt to a large pot and place over high heat for the pasta. While it's heating, prepare the cheese sauce. For the cheese sauce: In a large saucepan, melt the butter over medium heat. Whisk in the flour and continue to whisk and cook for about 2 minutes. Very slowly add the milk, a little at a time, whisking constantly. Once all the milk has been added, cook, stirring frequently until the sauce thickens, about 10 minutes. (Don't rush this step. The mixture will not be thick, but will noticeably thicken after 8-10 minutes of cooking). Remove the saucepan from the heat. Add the cheese, salt, chili powder and garlic powder. Stir until the cheese is melted and all the ingredients are incorporated, about 3 minutes. (If the cheese isn't melted completely after about 3 minutes, you can put the pan back on low heat and stir until it is melted). Set aside for a minute. Preheat oven to 350F (175C) with rack in the centre of the oven. 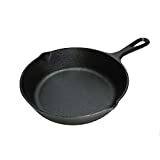 Oil or butter an 8-inch square baking dish, an 8-inch cast-iron skillet or individual baking dishes. When the pasta water is boiling, add the macaroni and cook for 2 minutes less than the package directions indicate. 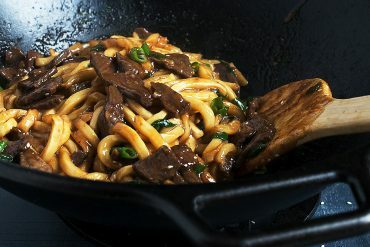 (The noodles will finish cooking in the sauce in the oven). When the pasta is cooked, drain and immediately rinse well with cold water. Make sure your pasta is well drained. Add the cooked pasta and to the cheese sauce and mix gently, but thoroughly. (It might look like too much sauce or too little pasta, but trust me, it will all be good in the end). Spoon or ladle the mixture into a prepared baking dish or individual dishes. Sprinkle the top of each with a bit of additional grated sharp cheddar cheese (you don't need a lot here, as there is plenty in the sauce), then sprinkle with the chipotle chili powder. Bake in the preheated 350F (175C) oven uncovered for 20 to 25 minutes, until the sauce has bubbled up around the edges and the top has a nice golden crust. Let sit for a few minutes before serving. 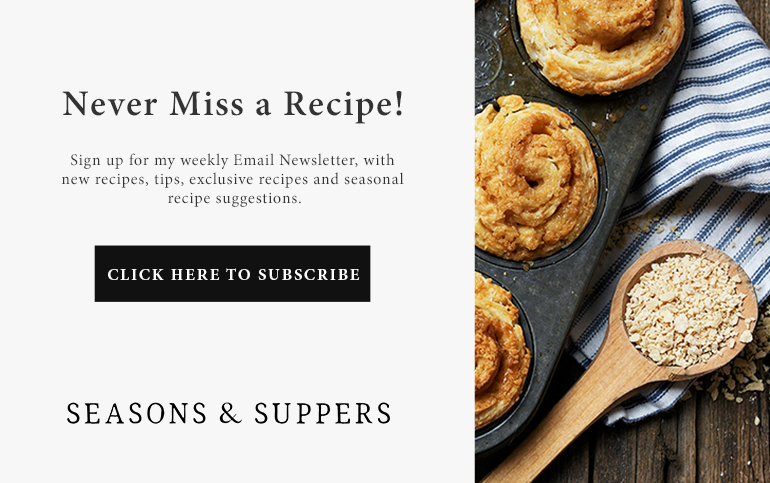 Disclosure: Seasons and Suppers is an Amazon Affiliate, which simply means that if you make a purchase through these links, I will earn a very small commission at no additional cost to you! Wow! Wow! Wow! We tripled it and used whipping cream for the last cup of milk. Added ground beef to it too!! It was fantastic! Decided to try a new recipe and I liked the way this one looked. We made a triple batch of this but used whip cream instead of milk and also used smoked aged cheddar that we smoked a while back. At first i was worried at how runny it appeared. But after letting it sit on the counter after baking it for 10 min it was awesome. Thank you so much for this great recipe Jennifer. So glad it was a hit, Margrit :) Sounds lovely. Thanks! Will be making this as a side to my beef sliders tonight…. Not for publication but if you go to number 7 I feel you have a grammar error in the first sentence forgive me if I am wrong but the word “and” needs to be deleted…. Next to that will let you k ow how it came out for my family..thanks. I made this and added cooked chicken and vegetables before baking it and it was delicious!! Do you use about 1/2 of the 230 g, tub of the MacLaren’s Imperial cold packed cheddar for this recipe? Hi Benita, you want to use about 3 oz, so if my math is right, it would be a little less than half (3/8th of the round). Enjoy! Do you use about 1/2 of the 230g. tub MacLaren’s Imperial cold packed cheddar for this recipe? 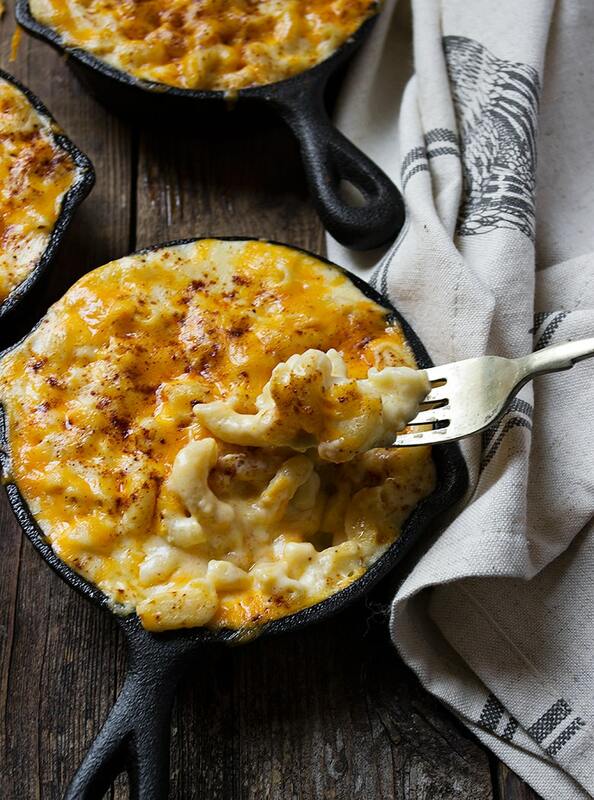 Best Mac n Cheese recipe ever ! And my husband is a chef :-) !!! Thank you so much for the most wonderful macaroni and cheese that I have ever tasted and my family agreed!! It was creamy, cheesy, tasty and melt in your mouth delicious! I will most definitely make your recipe time and time again for all of us to save her the flavor. Thank you again! Thanks so much, Colleen and glad you all enjoyed it! 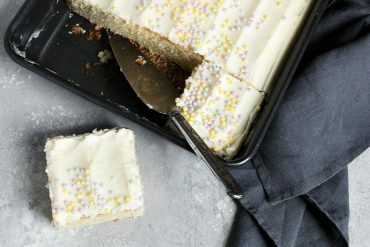 This looks so delicious and the perfect comfort food! Can’t wait to try this! Made this for dinner tonight, doubled the recipe as I’m feeding 7 people. Best Mac & Cheese I ever had. Question, any suggestions if I want to refrigerate or freeze? Glad to hear, Marion. I haven’t frozen it (never have that much left ;), but I feel like it would freeze pretty well. 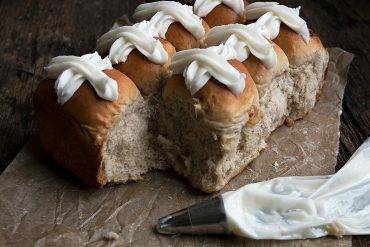 I often make this in individual dishes, bake off and then cover and refrigerate for family to enjoy from the fridge. 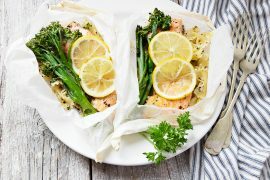 We usually just re-warm them in the microwave, but you could also cover with foil and pop in the oven. They are a tiny bit less creamy after the trip to the fridge, but still pretty darned good! My husband mentioned that since he became lactose intolerant he really misses mac and cheese. He can have the butter and the good, old cheddar but not the milk and doesn’t do well with the lactase product and others like it. Wondering how this would work with soy milk instead? Hi PA, I haven’t actually tried it, but I did a little checking around and it looks like soy milk should work. That said, it may not thicken as regular milk would, so be prepared with a little cornstarch and water mixture to thicken at the end, if necessary. Let me know how it works if you try it! 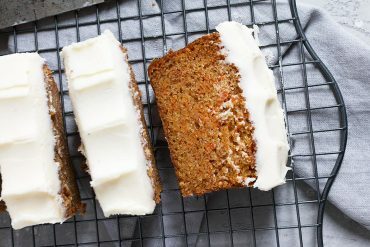 I tried this recipe using coconut milk (father is lactose intolerant but can still have cheese) and it was insanely good! Thickened up perfectly and was super creamy. I used 7oz of medium cheddar and 3oz of Swiss because it was what I had in the fridge. Best mac and cheese I’ve ever had for sure! So glad to hear, Amelia. I suspect the cream in the coconut milk helps in the creamy department here :) Thanks! Made this yesterday…..easy and creamy and cheesy! For the 7 oz. I used old cheddar and for the 3 oz. I split it between a firm cheese with garlic flower seasoning and a semi-firm beer ripened cheese both from Quebec. All in all a fantastic recipe! So glad to hear, Linda :) Sounds delicious! Thanks. Excellent recipe Jennifer. I add some bacon and turkey bacon pieces to mine. Also put some breadcrumbs on top for some extra chewiness. It is not possible to eat other mac and cheeses after cooking this one, and this has become #1 dinner choice with my teenage boys. Can I make the sauce the day before and then cook macaroni and add to warmed up sauce and then bake. WOW I’ve hesitated a long time before trying to make my own M&C. Yours is the best recipe!!! Thanks Lynda! So glad you enjoyed it! This was amazing! I’ve never had such a creamy baked mac and cheese before. The only change was that I added a parmesan and breadcrumb topping. I also like to warm my milk in the microwave before adding it to the roux and this reduces the time required to thicken the sauce to around 4 minutes. So glad you enjoyed it Julia and great tip to warm the milk first :) Thanks! 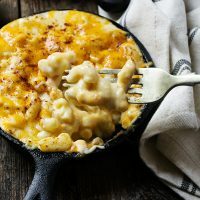 Hi Jennifer, this recipe looks amazing I always buy McLarens and was looking for mac & cheese recipe to use it in, however has anybody ever used ham in this recipe. I have a few chunks of Ham in my freezer from a big ham hock and I was wondering if I could use it in the mac & cheese recipe or if it’d be too salty. Follow up: Great after freezing. I made the recipe but did not bake. Once at room temp it went to the freezer. From frozen I microwaved for 15 minutes then put in oven @ 350 for 1/2 hour. (8 1/2″ square / 3 qt Corning dish) It was just as good as fresh made…very creamy. This is now my ‘go to’ mac ‘n cheese. Great even after freezing: I froze before baking. Microwaved from freezer and stirred it around a little once thawed then put into oven to keep hot and with some cheese & bread crumbs on top. Just like fresh made. I didn’t need to but anyone could add milk if they thought it needed. That is so great to know, Sharron! I have never tried freezing, so appreciate you sharing how to do it successfully. Thanks! Wow!! Great recipe. We love it…very creamy and lots of cheese flavour. Reheated leftovers…added some milk then heated first in microwave then put in oven for a while and it was super. Used PC extra sharp white cheddar & MacLarens Imperial cheese. Now for the freezer test: I just made up the recipe and will freeze. I like to make things in batches. So glad to hear, Sharron! I have tried this recipe with all kinds of cheese, but I always come back to the bit of MacLarens. Love the zing it brings :) So are you freezing before you bake it then? Let me know how it makes out after the freezer. This looks delicious! I am making lunch for my staff and was wondering if anyone has made this dish a couple of days in advance and then served it? Hi Megan, Hopefully someone who has actually done that can weigh in for you, but I can tell you what the leftovers are like from the fridge. The sauce in this one does thicken up as it sits in the fridge, so it’s not quite as “saucy”. That said, it’s still pretty darned good and quite acceptable when re-heated in the microwave 24 hours later. Thanks Irene and yes, this has been my one and only mac and cheese recipe since I first made it :) I’m glad you found the MacLaren’s. I love that sharp cheddar note and I miss it when I make this one without it. What a receipe – EXCEPTIONAL!!!! The cheese sauce is a bit time consuming but it certainly results in a creamy sauce. Had to ask where to find the MacLaren’s Imperial cheese. Glad it was available as it added a nice tang. 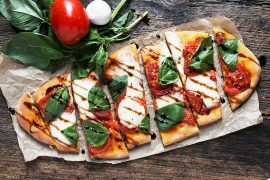 Receipe has become THE one – all others gone! We made this tonight… I added crispy pancetta and Panko breadcrumbs on top and added a habanero cheese as well. It was the CREAMIEST almost delicious recipe. The key is really the roux and amount of milk! It was sooooo good. I baked it in a larger cast iron pan. This is my new go to Mac n cheese recipe. THANK YOU!!! Oh. My. GAWD. Ive never made macaroni and cheese from scratch and let me tell y’all- I will NEVER buy box again after making this recipe. Holy moly! I used truffle salt and a bit of goat cheese to make it my own taste, and because I was out of chili. Haha it didn’t make it to the oven. I just ate it out of the pot, by the spoonful. I’m repleat. I’m happy. I’m grateful for this recipe! So glad you enjoyed this! It will always be my go-to mac and cheese :) Thanks! Hi Flo, I don’t see why not. You’re basically making a cheese sauce and the flour/butter roux does the thickening, so the milk is just liquid here. Either one should work. I’d probably go with the almond, as the it has less added flavour. My son asked for M&C with dinner tonight, so the search was on for a new recipe, and here I am! Unfortunately, I don’t get home from work until dinner time. I do all of the meal prep in the morning and my husband finishes the dish. 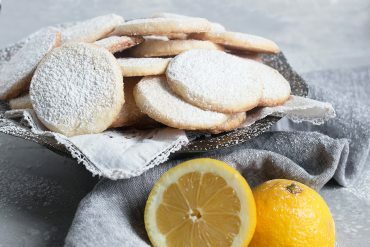 Is it possible for me to complete all steps except the final step of baking? I do not want us to eat it reheated, and I’m hoping that the dish wouldn’t be compromised in the slightest if we did it this way. Hi Kim, I think that would work. It will definitely need a bit longer in the oven from cold. Enjoy! Easy to make for a 78yr old guy! Made this dish tonight and added a little chicken and broccoli. It was delicious and will be my go to Mac n Cheese recipe! I’ll make it for the Senior Center. How do I reheat it? They’ll love it. There is no oven there, just a microwave and a stove top. Help. Hi Margaret, This reheats pretty well and the microwave should do just fine. I would do in several smaller batches instead of one large container, so it doesn’t have to be microwaved so much to reheat it all. It’s a little less creamy when reheated vs. when it is freshly baked, but still delicious :) Enjoy! Just made this for lunch today and it was delicious. Incredibly rich, though. I used Cracker Barrel extra sharp white cheddar and monterey jack. I wasn’t going to do the baking part, but it definitely needed it. I also used small shells instead of macaroni and it worked out great. Thanks for the recipe! What are your thoughts about adding cream cheese to the cheese sauce? Hi Chelsey, I have to be honest and say, I wouldn’t. The sauce doesn’t need it for creaminess. It’s plenty creamy enough. And it’s kind of shame (in my opinion) to start with a great cheddar and muddy up the flavours with cream cheese flavour. Now the only exception to that might be if you wanted to do a variation in sort of a jalapeno popper flavour. I’d start with a less expensive cheddar and add some cream cheese and sauteed jalapenos. That would be nice, I think. Oh my goodness the creamy, deliciousness. My kids would love this so much! This is a great recipe! I would love to make it this year for Thanksgiving, how can I adapt the ingredients to serve 8-10 people? Hi Chelsey, you can just double the recipe and you’ll have plenty, especially if it’s a side dish. Thanks for the recipe. I used sharp cheddar and Monterey Jack. My husband really enjoyed this and so did my kids so it’s definitely a keeper. Can’t wait to experiment with some more cheeses. I’ve made this twice in the past ten days – an obvious hit around here. First time around, I used the Coastal Cheddar for the main cheese – Heaven! Then, last night Kerrygold Dubliner which was also great. I have several recipes for M&C in my repertoire, some using combinations of expensive cheeses and other additions. This one is a classic, I think – there’ll always be a place for it. Thanks, Jennifer! I saw a recent chef-hint to divide leftover refrigerated Mac & Cheese into squares in preparation for broiling w/extra grated cheese on top. Serve as lunch or as sides. I have yet to try it, but I’m intrigued because I never have much luck re-heating M&C leftovers without it separating into an oily mess. It’s a big hit in my house, too! And you’re right, it’s just a great classic mac and cheese. I’ve tried it with a number of cheese combinations, but always seem to drift back to the Coastal/Imperial combination. Just hits all the right notes for me. Christine, is that you? Foodelf? I’m taking a huge stab in the dark. If you can, please let me know how you’re doing. Miss you. Cheers. This was by far the best mac and cheese my fiance and I have ever made!!! I made this for my potluck lunch on Friday for work ….but instead of tossing it into the oven after we finished on the stove top I put it into a crockpot then into the over night. Then once I got into the office on Friday put the crockpot on and let it get warm. Everyone in my office LOVED IT! I actually doubled the recipe and had enough left over just for my fiance and I…which then we ate for lunch today! SO SO SO GOOD! Def. will be making again. So glad you enjoyed it, Heather. My favourite! Glad you enjoyed it, Josie. Beecher’s uses penne for their famous mac and cheese. Thanks Viv. Yes, my daughter was fond on the chili powder. She puts extra on hers. The recipe looks great! However, I’m confused about the pasta measurement, is it just 1 2/3 cups or the whole box? Hi Abeje, I always weigh my pasta, but to help people out who don’t have scales, after I weighed it, I put it into a 2-cup glass measure and it measured out to 1 2/3 cups. If your box happens to be 8oz. then the whole box would work, too (as long as it’s macaroni). Hope that helps. I made this last night. It was SO GOOD. I had a stomach ache because I ate too much; it was that delicious. We used about half sharp cheddar and half pepperjack, because it was what was in the fridge! Sprinkled in some mustard and cayenne as well. Yum!! Glad you enjoyed it, Elizabeth. This really is the best macaroni & cheese I’ve ever made & it really is about good cheese. I used about 7 oz of sharp & 3 oz of coastal smoked cheese & it was perfect. You had me with the picture alone. This is great, Jennifer! I love the research you put into this :) I make a very similar recipe, but I never bake mine — we eat it straight from the pot. I should try baking it! And I should try using a nice cheese instead of just an economical one :) Yumm! It’s lunchtime! I love food research ;) I usually find that the baking part dries out mac & cheese, but not this one. It’s very, very saucy before baking and just perfect after 20 min in the oven. And what a revelation it was for me to find what a difference great cheese makes (I was like you and usually just grabbed the big block of Kraft Old). I have tried this at Pike Place Market and made it at home with their cheeses. 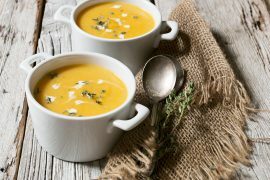 I do like the idea of it being extra creamy with the added sauce so I will seek out great cheese here in British Columbia and try my go to recipe once again. Enjoy Bellini. I’m sure you’ll find some great cheese options at home, too. Wow, this looks great Jennifer! You can never go wrong with good ol’ mac & cheese!